Not everyone wants to ride around wearing shoes that look and feel like a set of soccer cleats. 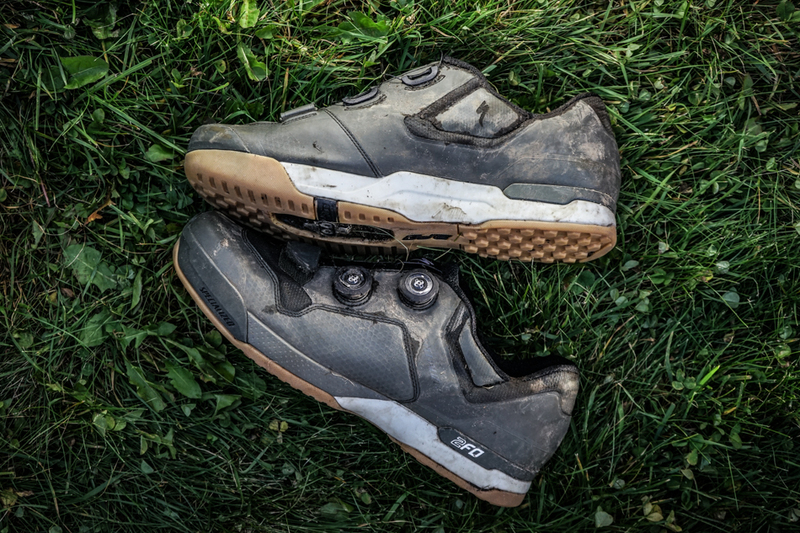 There are plenty of alternatives to the sleek, racy aesthetic of modern clips, but they're often little more than stiff-soled Vans Half Cabs with a place to bolt your cleats. But not the 2FO Cliplites. Combining all the science behind today's cutting edge race shoes, these kicks are actually aimed at the more aggressive crowd. The two Boa snap dials are the first standout. The Boa system is easier to use than traditional ratcheting straps (not that those are particularly difficult), and spreads the load a little wider. Plus, the closed system isn't as easy to clog with mud and brush. Every Specialized shoe uses their Body Geometry sole design and its unique ergonomic contours. Most noticeable is the slightly outward-slanting Varus wedge, which, for some riders, helps relieve stress in the knees and ankles. Also noticeable is that, true to their name, the Cliplites weigh less than most similar offerings from other brands. Like most modern all-mountain shoes, the Cliplites’ construction is simple and durable, not a patchwork of mesh panels. Anyone who has watched their shoes fall apart before the season ends probably has no problem sacrificing a little breathability. And the 2FO Cliplites are plenty comfortable otherwise. The slanted soles feel very natural during seated pedaling, but under heavy standing loads, the motion and angles change and the pressure gets concentrated on the inside edge of the feet and there's a little extra stress on the ankles. But your ankles will thank you for the 2FO's wide outsoles. When there's no choice but to get off and push, they step nearly as comfortably as a set of lightweight hiking shoes. The wide platform keeps you from rolling the wrong kind of joint, and the relatively soft rubber holds on well to rocks and roots, though they're not ideal for steep, soft slopes. The Boa retention system was as useful while wearing the shoes as it was when putting them on. It's simple to reach down and snug them up a click or two as needed, though I experienced a bit of a learning curve before I stopped overtightening them. And if you've got an arm full when coming home from a ride, they're easy to quickly loosen with one hand. Because of course, no shoes in the house–even if they're this fashionable.